This is one more recipe from the extensive Yucatecan recipe book, which food is the result of an Indigenous and European miscegenation, from which a variety of dishes flourished. Of course that the main ingredient of this salsa is the black bean because is the most abundant in Yucatan. And the name of the recipe comes from the fact that the traditional cooks passed the cooked beans through a fine strainer to remove their skin (the least digestible part). The reality is that nowadays this procedure is no longer carried out, just the blender is used and a very similar result is obtained. This salsa is soft and very savory. The bean flavor always predominates but also some spicy and fresh notes can be felt . It is perfect to accompany dishes like: eggs, rices, quesadillas – or simply to enjoy it accompanied of some tortilla chips. In this recipe you are going to cut, blend and cook. Everything is quite easy to do. Prepare the recipe with black beans because that’s how the original recipe is. 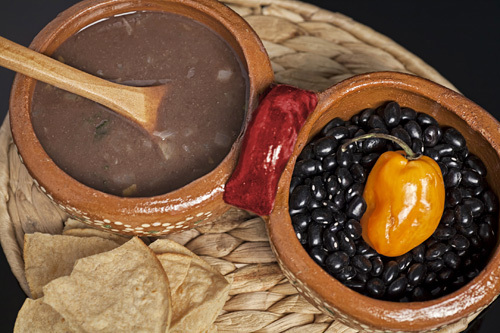 Among the ingredients cooked black beans are needed, which can be bought canned but we recommend preparing the pot beans because the final flavor is going to be much better. For the preparation the broth of the beans is needed. In case of not getting it substitute it for 1 cup of water. This preparation requires of about 15 minutes . The recipe yields about 6 portions. Remove the veins and the seeds of 1 habanero pepper. If you want to give a lot of hotness to your salsa, leave the veins and the seeds of the habanero pepper. Finely chop the habanero pepper with the one you worked and 1/2 onion; then reserve. 1½ cups of cooked Black Beans. 1 cup of cooked Black Bean Broth. The Habanero Pepper that was minced. Mix the saucepan ingredients and fry them for approximately 1 minute, until the onion looks a bit transparent; stir regularly. Mix the saucepan ingredients and bring the strained bean salsa to a boil over high heat. When the strained bean salsa boils reduce to low heat and cook it for about 10 minutes, until it thickens a little; stir occasionally. Variation: Now taste the beans in the version of a dip. Did you like the Bean Salsa? Know more traditions about the Mexican salsas. These are the best canned beans that can be used for the preparation. These habanero peppers have a hotness that you will never forget.